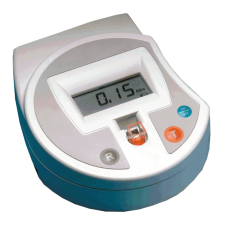 Your colorimeter is a small, robust, easy to use instrument designed for use by doctors and medical technologists in small and medium sized clinics. The unit has been tropicalised to protect it in hot and humid conditions (to 45°C and 70%, respectively); the 10 gelatin filters are encased in glass to prevent fungal growths appearing and the PCB has been conformally coated so that individual components are sealed to prevent corrosion. The instrument is powered by an internal rechargeable NiMH battery or by external power allowing it to be used where the power supply could be unreliable.